Feel Better Lion - 12"
No one likes to feel under the weather. 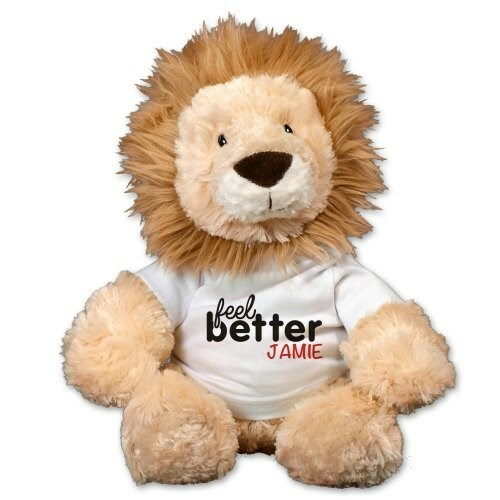 Brighten up their day by sending them this plush Feel Better Soon Lion. Our lovable lion is wearing a t-shirt that may be personalized with any name to make it a truly special gift. The get well design is featured on our plush Tubbie Wubbie Lion. Tubbie Wubbie is the fluffiest, stuffed lion around, made from velvety, soft, shaggy plush fabric to give it the softest feel. It was designed with an overstuffed body to make it a good cuddling pal. A charming and warm face gives this plush lion plenty of character. Measuring 12” tall with lock washer eyes to provide safety and longevity. Made from all new kid-safe man-made materials and meets or exceeds all U.S. safety standards. Surface washable. Free gift wrapping and a free gift message are included to create a thoughtful presentation. The person that I bought it for, said she loved it and it put a smile on her face. Wonderful, sweet economical gift!!! My friend loved it! Additional Details Shop all of our get well bears to find one that is sure to brighten your loved one's day.